The black binding sets it off perfectly, and I bet your SIL and baby Reagan are going to *love* it! I am so impressed that you were able to get all your big projects wrapped up in time, and I hope that when baby is ready you both have a smooth transition. 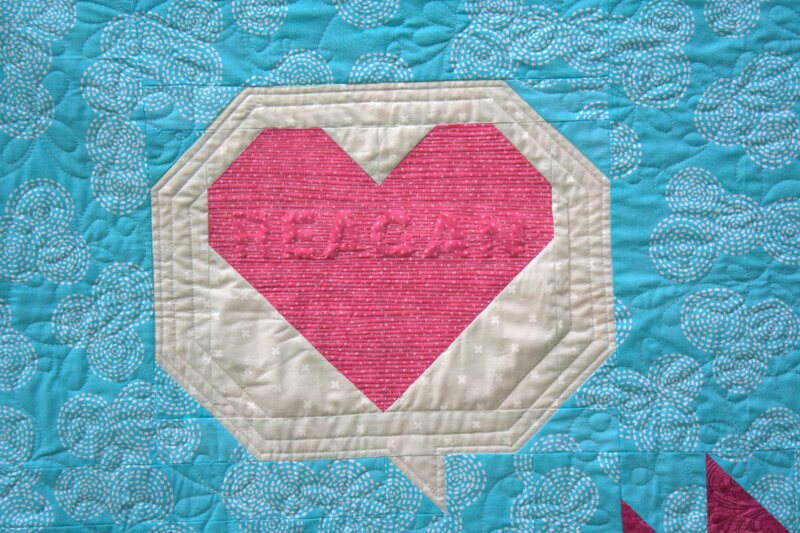 This Baby Regan quilt is just so cute. 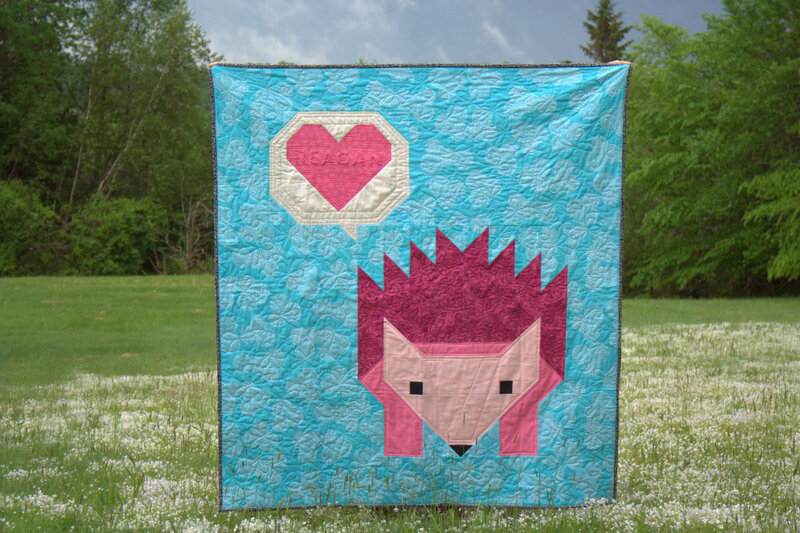 When you blogged about the matchstick quilting I did not realize that the heart was going to be so big and it looks great! I am going to try this machine quilting technique on a big heart wall hanging. I love your pictures, they inspire me. You are right, your baby will come when it is ready. Very cute! Great choice of binding too! Love every last little bit of Pinkalicious Hazel! Especially how you made a popular design into a creation that’s all your own. 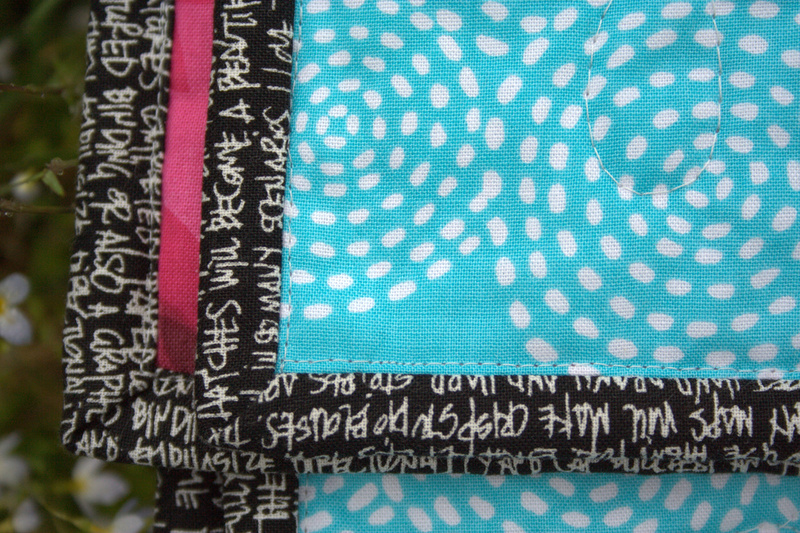 One never thinks to do a black binding for a baby quilt, but it works so well! Love the name in the name stitched into the heart. This is beyond adorable. So much talent! 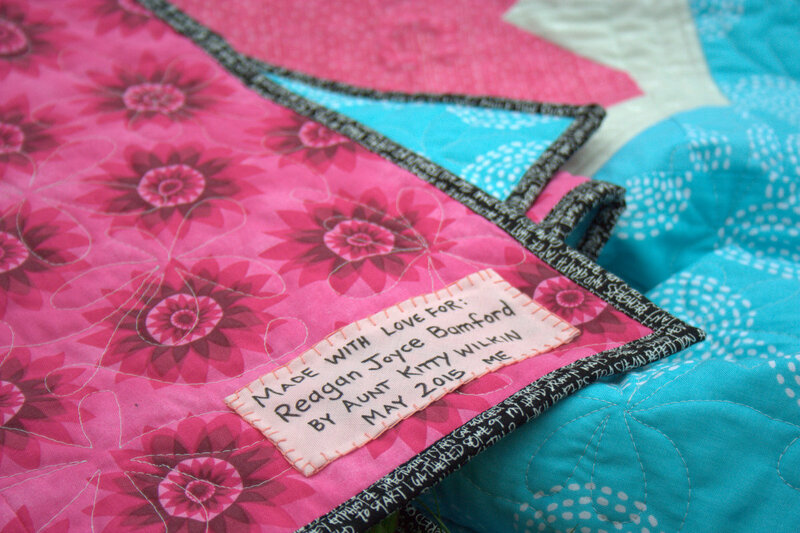 That is the best baby quilt I have ever seen – so personalized and you know the pink is beautifully offset by the blue background and gorgeous black binding. I LOVE it. 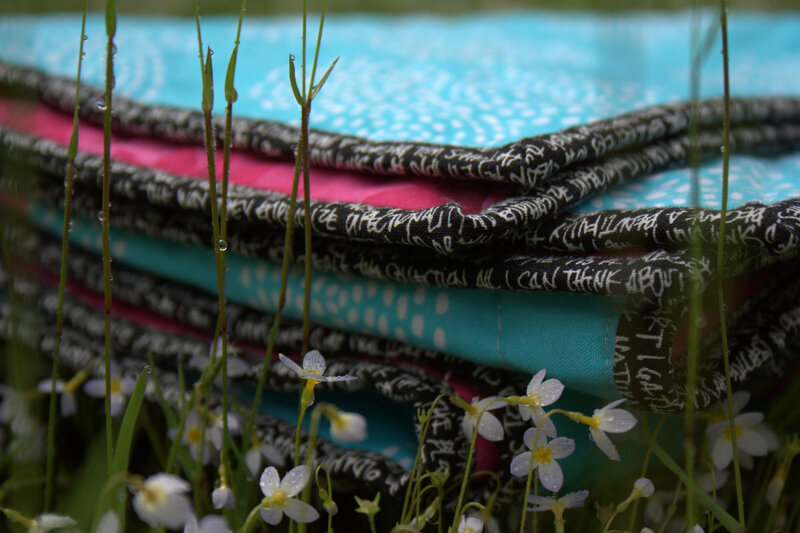 The quilting is gorgeous and you are right – machine binding is much more durable. What a great finish! I’ve loved seeing this quilt come together. Adorable quilt. She’s going to love it. I’m impressed that you track all the time. Good luck with YOUR baby – any minute now I just know it. Just darling! 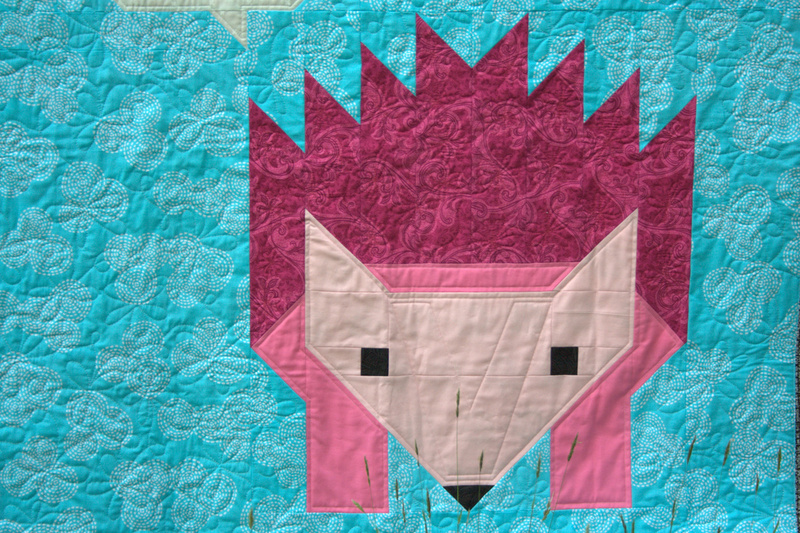 I especially love the quilting. They have named Reagan already? That must be the opposite of the Scandinavian tradition of waiting a few months to see what the baby’s name should be. I love decisiveness. 🙂 Was that to help quilt-making aunt plan the adorable quilt with personalised name? How have you never blanket stitched before? YAY I’m so glad to see it finished! I love the black binding, I did that on one of my quilts recently and was just so happy with how it came out. I tend to not like the look of my hand blanket stitch when doing tags and have more than once machine’d it on trying to find a discrete spot where the “extra quilting” won’t look funny on the front. 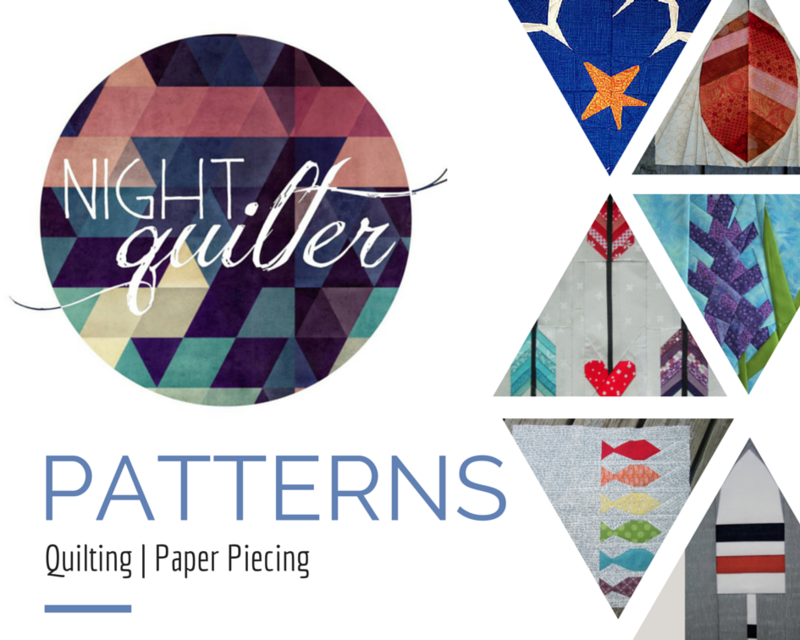 Works pretty well for some quilts, especially the ones I just want to finish! I can never remember how to start a blanket stitch when doing it by hand – thank God for you tube! Love the label. It really is a gorgeous quilt. So glad you kept he speech bubble & heart!